See an overview of the map lines, areas, routes, and navigation icons. ► The system displays the map legend. A visual guide helps you see the map legend. 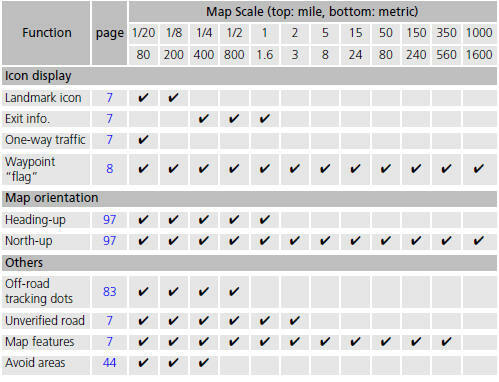 The functions that are available from the map screen depend on the map scale. You can change between miles or kilometers. Display or hide all icons on the map screen, with the exception of Honda/Acura Dealer icons which are always shown. Icons that can be displayed or hidden. 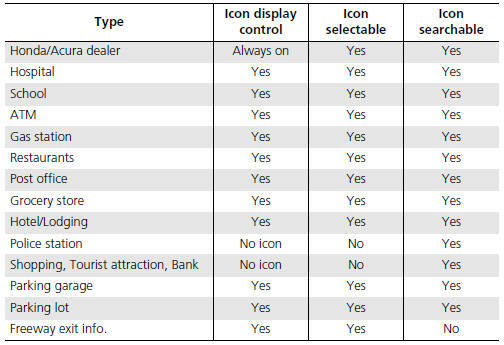 Icons that can be selected as a destination using the joystick. Select the map orientation icon to change the map orientation. “Display North-up” (from map screen) The red arrow in the symbol always points North. On scales greater than 1 mile, North-up mode is always used. Display and save your current location for future use as a destination. The address, latitude, longitude, and elevation of your current location are displayed. 1. Select the vehicle icon on the map. 3. Edit the name, phone number, and category. map screen) You can also save the current location by saying “Register the Current Location”. If you have PIN-protected your address book, enter your PIN when prompted. Select OK. PINs are optional. The elevation is not displayed if the system is receiving insufficient GPS information. When elevation is displayed, it may differ with roadside elevation signs by ±100 feet or more. Saving your current location does not change or cancel your current route.